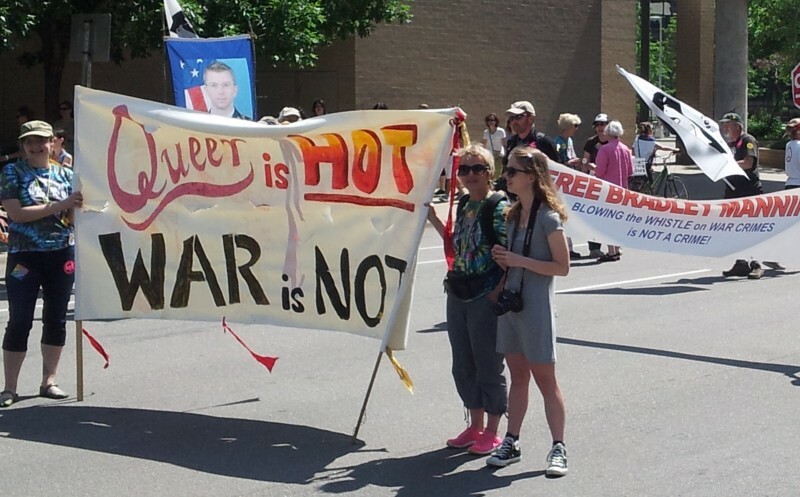 Minneapolis Pride march 2013: 'Queer is hot, war is not!' | Fight Back! Minneapolis, MN – A peace contingent, made up of the Anti-War Committee, Women Against Military Madness, the Minnesota Committee to Stop FBI Repression, Free Bradley Manning-Minneapolis and others, had a strong showing at the annual Minneapolis LGBTQ Pride parade this year. The contingent participated in the annual parade down Hennepin Avenue to Loring Park on June 30. Jess Sundin, of the Anti-War Committee stated "My rainbow family and I loved marching in the peace contingent. It was great to see the anti-war movement united chanting 'Queer is hot, war is not!' together." March participant Anne Keirstead said, "It was great to see people marching together to free Bradley Manning and to end U.S. warfare. The crowd was electrified by the peace contingent. Everyone in our section chanted and cheered together."